Security Services has launched a new Online Exchange Zone at McGill in an effort to make online transactions safer for buyers and sellers. 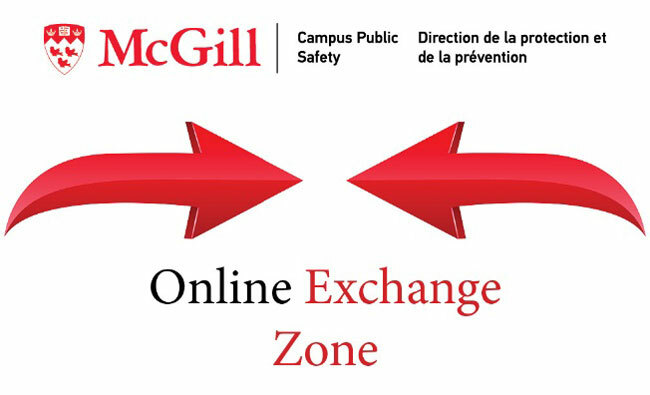 Security Services has launched a new Online Exchange Zone (OEZ) at McGill in an effort to make online transactions safer for buyers and sellers. In a move to improve safety for people who buy and sell goods online, the OEZ offers a place where people can complete transactions in the relative safety of Burnside Lobby. The buy and sell zone is a crime prevention initiative aimed at reducing all types of crime, including fraud or even violent crime. The exchange zone is under camera surveillance (but not necessarily monitored) in the lobby and the building is opened between 7 a.m. – 10 p.m. Even if you don’t use the Exchange Zone, Security Services recommends that you think about the following if you do buy or sell something online: avoid conducting transactions alone; make a friend or family member aware of the details; meet in public areas if possible, complete the transaction during daylight hours, be extra cautious buying/selling valuable items, consider using email to transfer funds; and if someone is not willing to come to the Online Exchange Zone it could be a scam; finally -always trust your instincts.